The Prosonic Midi Chord Progression Library is the largest midi progression library in the world. 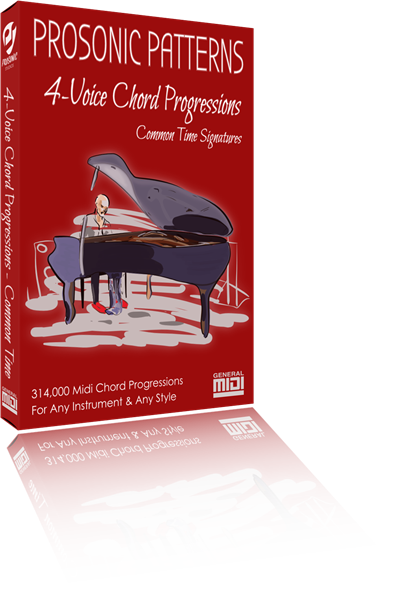 It's packed with thousands of professional chord progressions, in both common and complex time. "It's like having a secret-stash of inspiration and new ideas that'll make your music amazing - fast." Free chord progressions for download in each library! Break through writer's block and write faster than ever with a pack of Triad Chord Progressions! Triad progressions sound great in any style and provide a base layer that you can add your own colors to; or use them 'out-of-the-box' for a classical sound. They're great for learning harmony. Ever wondered, "what makes a great chord progression tick?" Now you'll be able to look 'under the hood' and see what's really going on! So what would happen if you had better harmony in your music? Isn't it time you find out? Take your creativity to the next level and compose faster than ever with a pack of 4-Voice Chord Progressions! 4-Voice progressions have more texture and are perfect for when you want a little more color. 4-voice chords also sound great in any style. They're great for learning four-part harmony. Now you'll be able to take an in-depth-look and see what's really going on! Compose more insteresting and artistic music with a pack of Triad Chord Progressions in Complex Time! Triad progressions in complex time are for those who want to experiment with unique chord rhythms. Intricate rhythms can add a lot of interest to your music. They're great for learning how harmony works in odd signatures too. Now you'll be able to take an in-depth-look and see what's really going on! 4/4 can get boring! Spice-it-up with interesting rhythms! 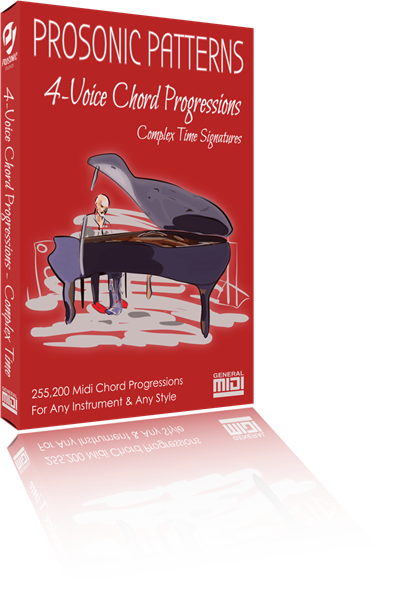 Compose more insteresting and artistic music with a pack of 4-Voice Chord Progressions in Complex Time! 4-Voice progressions in complex time are for those who want to experiment with unique chord rhythms. Intricate rhythms can add a lot of interest to your music. They're great for learning how four-part harmony works in odd signatures too. Now you'll be able to look 'under the hood' and see what's really going on!